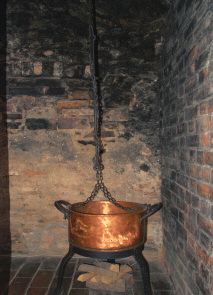 Lokys is one of the most authentic medieval restaurants in Vilnius. 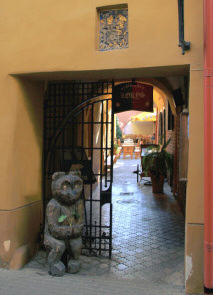 and is easy to find as the restaurant’s wooden bear greets you at the entrance. 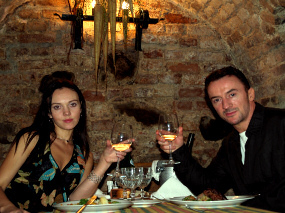 Lokys restaurant has a medieval feel about it as you walk down the amazingly narrow winding stairs to the dining room set in the authentic low arched gothic cellars that date back to the 15th century. Even though Lija said that in the warm season they have a lovely courtyard seating outside, I would still prefer the cellars, which make for the unique atmosphere. The staff at the entrance made us feel welcome. They offered us a table in one of their cosy cellars at the back of the restaurant, which you enter through a narrow arched doorway. The service was quick and in no time we were able to order. Whilst waiting we had a chance to look around. The lit candles on the wall, thick wooden table and medieval decorations created a truly romantic experience. My only small complaint being that the lighting could have been a shade dimmer. Overall the ambiance was great and the fact that the cellars used to be a tavern through the centuries makes you feel you have travelled in time to medieval Lithuania. It was hard for me to make a choice of the main course. The trouble was I had never had wild animal meat before but I was in the mood for something more adventurous. 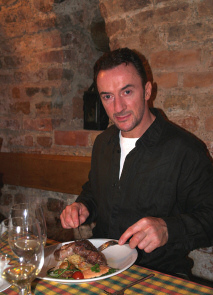 The restaurant also serves more traditional meat dishes, such as chicken, fish and beef. I really enjoyed my food, it arrived nicely presented on a hot plate and had a mixture of nice flavours. Lija chose to sample one out of the few vegetarian dishes. However hot vegetables with chanterelles and rice (5 €) came as a bit of disappointment. The vegetables, though nicely cooked, were rather bland (some flavoursome dressing would have helped) and the slightly bitter flavour of mushrooms was not to her taste. (12 €) came to (40 €) and we would recommend to visit the restaurant when in Vilnius. 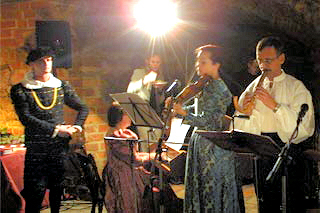 As Lokys is one of the medieval restaurants in Vilnius, at the weekends they play live medieval music. If you are a group of 10 or more people, if you wish, for a fixed price you can arrange a medieval feast in the restaurant. It lasts for about 2 hours. You will learn about medieval traditions, while having old recipe meals with olden time’s forks and knifes, just as it was centuries ago. You will be listening to the medieval music, play medieval games and will be entertained by the housemaster and his servants.